HomeBlogThe BibleWill God Ever Tell Us Not to Pray? How strange. 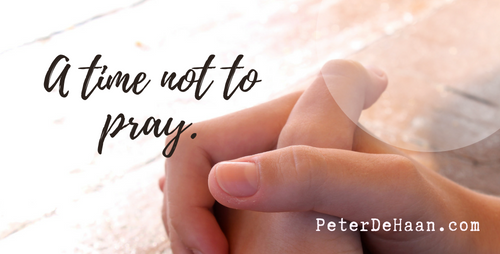 Doesn’t God want us to pray? Why would he tell Jeremiah not to pray? God has his reasons. He has a plan. This plan may not make sense to us. In fact, it may seem foolish. But we also believe he will work things out for the good of his people who love him (Romans 8:28). One time I visited a church with a friend. They were between pastors and struggling, yet a core group worked hard to help this church grow and move into their future. Since the church was in a different city, there wasn’t much I could do to help or join in their work. However, I could pray. In fact, God prompted me to commit to pray for them every day. And I did that. Well, at least most every day. This small congregation had a committed group of people dedicated to following Jesus. They desired to make a difference in the community. And even though they didn’t have a pastor to lead them, they moved forward on their own. They seem to be making a difference. Yet God told me my season for praying for them was over. Though he didn’t tell me he wouldn’t answer my prayers if I continued, he made it clear I would displease him if I persisted. I stopped praying for that church that day. I don’t know why God had me stop, but I do know it was part of his greater plan. Maybe one day I’ll have greater insight into what his plan was when he told me not to pray—or maybe I’ll never know. Either way I trust God in the outcome even if it doesn’t make sense to me now.